I have argued that learning is having new questions to ask. Here are a few questions that have surfaced in the early weeks of the semester. These are all student questions in College Algebra. (1) Can it still be a variable if it only has one value? This was asked by a student as we were sorting out whether counts as a function, and whether it counts as a one-to-one function. (2) How do you solve for ? This was asked by a student as were considering the relationships among functions, inverses and inverse functions. (3) Is the inverse of a circle an inside-out circle? See, we were using a set of equations, considering x as the domain and y as the range. We were asking whether each equation—so viewed—is a function and whether it is one-to-one. Then we were switching domain and range (i.e. swapping x and y) and asking the same questions about this new equation. Bonus question was to solve each of the new equations for y. 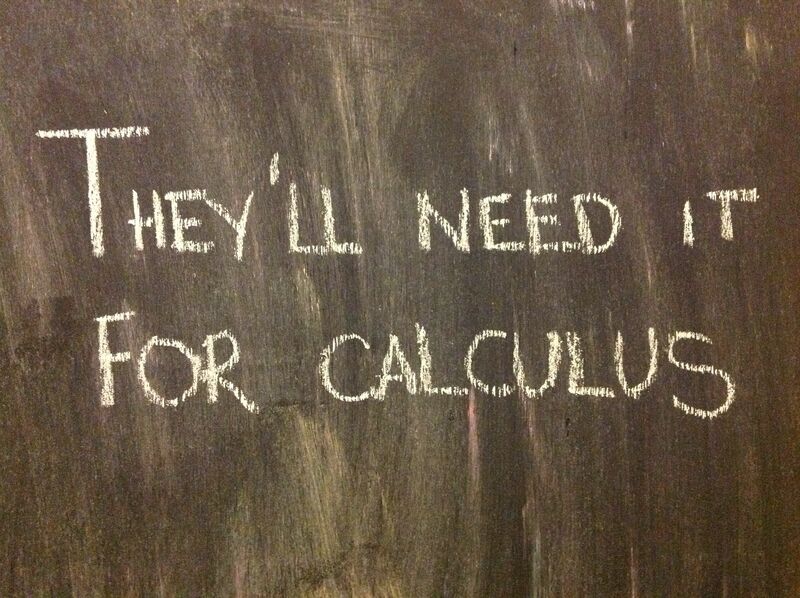 One of our equations was . Swap and and get back the same thing. Thus, a circle (as a relation) is its own inverse. Which fact I had never considered. But my purpose here is to check in on the progress I am making in fostering and noticing student questions as evidence of learning. Two years ago, I began using unit as an organizing theme in the math content course for future elementary teachers. That led to many adventures, including a TED-Ed video and new ways of talking to my colleagues about fractions, decimals and place value. That work continues, but it has become part of my instructional practice; one of my habits of mind. This year, I am thinking about sameness, and about helping my students to notice and pay attention to sameness. The formal name is equivalence, but I am not so worried about the vocabulary and formal definitions here. I am concerned with helping students understand something about how mathematics views and uses sameness. It is awkward at first, as any new teaching moves are. But it got us some good stuff recently. We are studying functions. Our grounding metaphor for functions is vending machines. 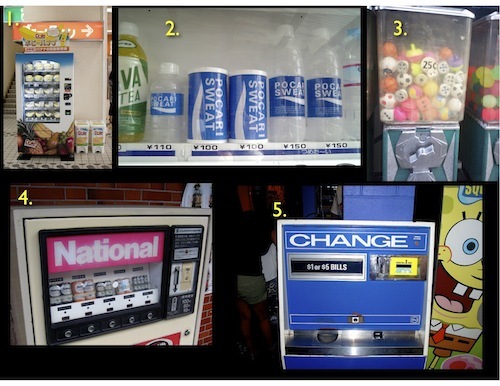 We discussed the following collection of vending machines the other day. This is my favorite vending machine of all time. The banana vending machine. It dispenses only bananas. It is like the constant function. More on this below. There are two ways to get the Pocari Sweat in a can. Two inputs, same output. That’s OK. It’s not one-to-one, but it’s a function. You put in a quarter, you turn the knob. Sometimes you get a die. Sometimes you get a top. Sometimes you get a ball. This is not a vending machine, really. Same input gets you different outputs. That’s a problem in the vending machine world, and in the world of functions. The battery vending machine is one-to-one. Each battery type has its own button to push. Put a dollar into this one, get a dollar out. Put in five dollars, get out five dollars. The output has the same value as the input. This is the identity function. We discussed these in class one day. Then we opened the next class session by having students brainstorm with their partners specific functions with the traits exemplified by the vending machines. We divided up responsibilities for recording these functions on the classroom whiteboards. Our example the previous day had been absolute value. They weren’t ready to venture much beyond this. As a class, they struggled to identify two x-values that would generate the same y-value. We need to work on that. But I have mentioned that this is College Algebra, right? Students have placed here, or worked their way here through developmental math. Either way, the idea of producing example points to demonstrate properties of a function has not been schooled into them yet. I’m on it. Again, +/– square root was the prior day’s example. I love +/– x as an extension of the technique. Love that. And square root of x is not right. We’ll come back to that. Having a permanent record of the difference will be helpful. Wow. Just wow. That was our example from the previous day. Not even a y=x+3 in the bunch! Work to do here. Now we’re having fun. I love the . 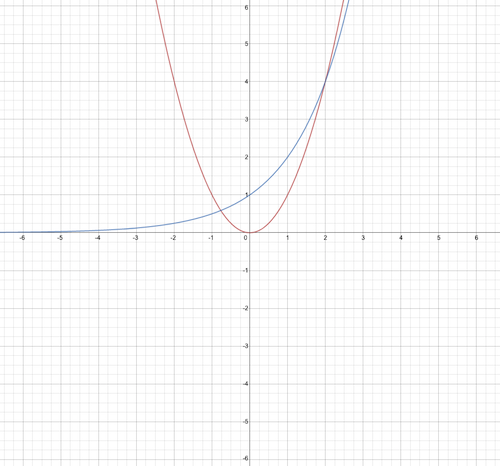 Same function, different notation. I finished off our work by asking whether is the same as . Which (finally!) brings us back to sameness. My students are highly accustomed to writing . But they are not accustomed to thinking about what this means. Because when , that equation is not true. The question then becomes, In what sense are these the same? And that points us to the very heart of the discipline. In mathematics, we decompose things according to their attributes, and we focus on one (or two, or…) of these attributes at a time, disregarding all of the others. Formally, when we write , we mean “These two expressions are the same for all but a finite number of values of x.” We don’t say that, of course, but that is the essence of the equal sign here. We returned to the sameness question with this video. Are the two outputs the same? How? Are they different in any way? How? Again, mathematical sameness requires us to specify the precise ways in which two objects are alike. We will return to machine number 3 above in class shortly. If you just want to get “a cheap plastic toy” out of the machine, then you get that every time. It’s a function. If you want to get “a top” out of the machine, then you get something different every time. 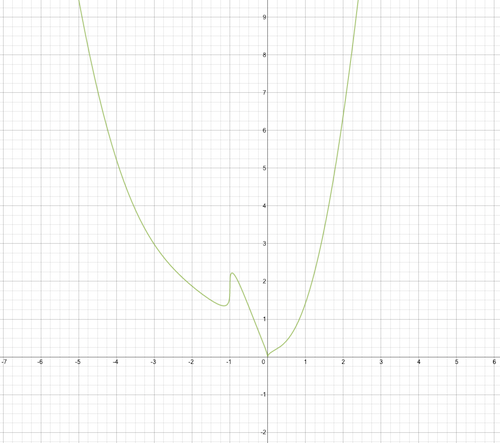 Is it a function? Depends on what you mean by “same”. Much more work to do. I’ll keep you posted. *I recently argued that learning is having new questions to ask. This student was learning about what variable means, and had a question to ask that she maybe could not have articulated before this. Michael Pershan boldly posted How I Teach Probability recently. I have struggled mightily with the teaching of probability over the years, so I took his video as an invitation to share and discuss. The following is a copy/paste of an email I sent him (with, perhaps, some light editing). I have been working on a longer, better edited version of the basic idea that I lay out here. But I’m working on tons of other stuff, too, so I cannot promise that the other one will ever see the light of day. So here you are. Enjoy. An important bit of honesty first: I am crap at teaching probability. Many reasons, mostly having to do with the ephemerality and abstraction of the topic, in contrast to the cold, hard demonstrable reality of (say) fractions. With that said, I seem to have been making progress with an approach that has one important extended feature to the sort of work you show in your video. Your video has (1) a scenario, (2) guesses, (3) small group data collection, and (4) large group data collection. To that I add (2.5) explicit discussion of students’ probability models that inform their guesses, and then (5) some related follow-up activities. 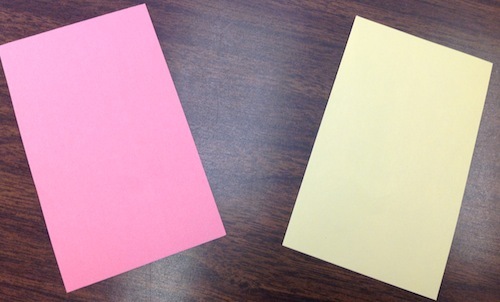 After collecting guesses, I ask someone in class to describe WHY they said what they said. My job, then, is to press for details and to capture what they are thinking as carefully and accurately as possible on the board. Once I have that, I ask for someone to describe a different way of thinking about it. Even if slightly different, we get it on the board. My writing isn’t abaout me dispensing wisdom, it is about making a permanent record of a student’s model in enough detail that we will be able to test it later. For anything even moderately complicated (such as rolling two dice and considering their sum), I am disappointed if we don’t get at least four different models. Now the data collection doesn’t just tell us who guessed closest; it can rule out at least some of our models. 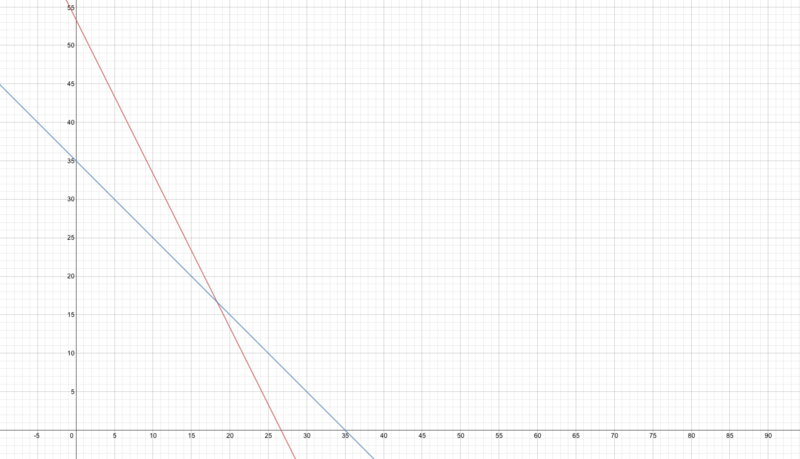 Model 1: Zero multiples of three and and one multiple of three are equally likely, so I’ll bet on either one. There are only four possibilities: 0, 1, 2 and 3 multiples of three, so the probability of each of these outcomes is 1/4. Model 2: There is more than one way to get 1 multiple of 3. Our model should account for that. There are three ways to get 1 multiple of 3 (on Die1, Die2 or Die3), three ways to get 2 multiples of 3, and only 1 way each to get 0 or 3 multiples of 3. That’s eight possibilities, so the probability of getting 1 multiple of 3 is 3/8, while 0 multiples is 1/8. Model 3: Each die can come up either “Mo3” or “NotMo3”. Getting all “NotMo3” has probability 1/8 (1/2*1/2*1/2), while getting one “Mo3” and 2 “NotMo3” is also 1/8, but there are 3 ways to do it, so it’s 3/8 altogether. As many different ways of thinking about it as my students have, I will dutifully record. I encourage argument, as each new argument suggests a new model, which we can test. Now before we roll those dice, we set up a way to test these models. In my experience, I have to devise that test. My students are not sophisticated enough to think this way yet. In your example, and with these models, I might identify an important difference to be that Model 1 predicts equal numbers of 0 multiples of 3 and 1 multiple of 3, while Models 2 and 3 predict three times as many 1s as 0s. Hopefully we also have a model that predicts something in between. So now as we roll, we are not just looking for which happens more often, but to relative frequency. Because the model that better predicts the relative frequency that actually happens has got to be the better model. Much more to say, examples to offer, etc.